California Lawmakers Approve Cap-And-Trade Revenue Bill | "Global Possibilities"
How should California spend the billions in revenue to be generated in the coming years by its soon-to-launch cap-and-trade program? We’re closer to knowing the final answer, patient after a key vote in the California Legislature this week. On Tuesday, the California Assembly voted 47-26 to approve AB 1532 (PDF), a bill written by Speaker John A. Pérez, which provides a framework for how the state will spend revenue generated by its carbon market. 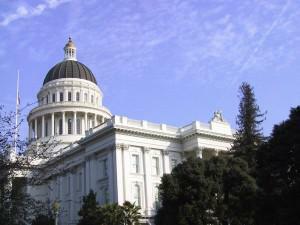 California’s cap-and-trade program launches on January 1, 2013; the launch will be preceded, on November 14, by the first of three state-run carbon allowance auctions scheduled for the California’s 2012-2013 fiscal year. As I wrote at this blog last month, Capitol insiders had predicted that the fate of the billions in auction revenue would dominate the legislative agenda in Sacramento this year. For lawmakers who have grappled in recent years with California’s chronic budget shortfalls, the sums involved are not inconsequential. Governor Jerry Brown’s budget plan, released in January, projected auction revenue of $1 billion in 2012-13. When the cap-and-trade program expands to include transportation fuels in 2015, auction revenue will ratchet upwards. AB 1352 designates five broad categories as permissible expenditures for auction revenue: renewable energy and energy efficiency; low-carbon transportation and infrastructure; natural resource protection; research and development; and empowering local leadership climate change planning and implementation. The bill would create the Greenhouse Gas Reduction Account within the Air Pollution Control Fund, which is controlled by the Air Resources Board (CARB). AB 1352 would further direct CARB, the agency tasked with administering AB 32, California’s pioneering climate change law, to develop an investment plan for the auction revenues every three years. CARB would be required to submit a status report by December of each year to the Legislature on projects funded by the account. Speaking at a carbon market conference in San Francisco last month, Panama Bartholomy, an energy adviser to Speaker Perez, had predicted that a final auction revenue bill would likely be a composite of his boss’ bill and several others. His office, he said, would work with the authors of competing bills to “try to have a smaller food fight.” Bartholomy’s magnanimity aside, it would appear that the Speaker’s Office has assured passage of the bill it wants, which happened to be its own. “California is a global leader in combating climate change, and we are proud that our state is the first to have created a carbon cap and trade system to reduce Greenhouse Gas emissions,” said Speaker Pérez in a statement. AB 1352 now moves on to the Senate, where passage is likely. Legislation sponsored by the legislative leadership rarely languishes.